Update: This article was produced for an older verison of the Android app development environment based upon Eclipse. Android apps are now developed in Android Studio. This article is now archived and provided for historical information only. This article examines the reason for this error and possible solutions. The latest Android devices now come with large memories, 1 GiB is now normal, and even larger memories will come in the future. When developing Apps for such devices it is natural to test them on AVDs that have the same specifications as the real world devices. When an AVD is set up using the AVD Manager program it is possible to choose existing device definitions. The Nexus 7 definition sets the RAM to 1024 MiB (1GiB). 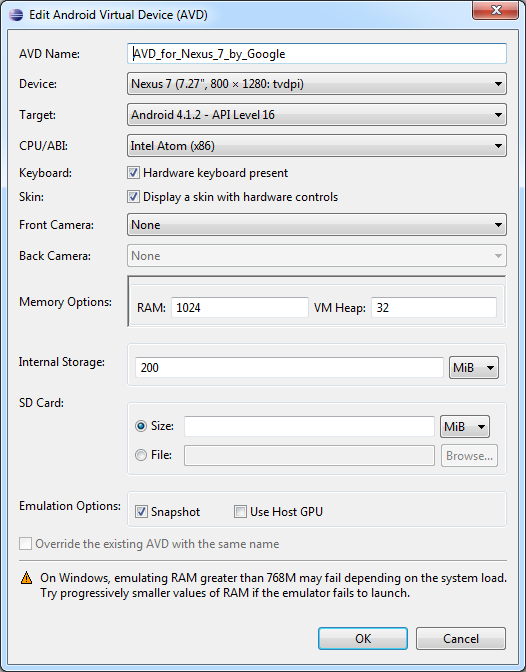 The RAM setting for the AVD is not all the RAM that the AVD uses. More RAM is required by the system to host and run the emulator code. An AVD given 1024 MiB can use up to 1.5 GiB when it is running. It makes having a high specification machine important when developing Android Apps. This screenshot from the Windows Resource Monitor utility (perfmon.exe /res) shows virtually no free memory, but that is OK because there is plenty of Standby memory, 5.7 GiB. Standby is the memory cache and is available to newly starting programs (Windows will free cached memory when other programs need it). So why did the AVD fail to get a memory allocation? Although the memory was available the emulator code and Windows memory manager are probably not handling the situation where the Standby memory becomes fragmented. In that case Windows needs to clear and sort several page caches to fulfill the large request, this may not occur quick enough for the starting AVD, hence the allocation failure. When this happens there are several things that can be tried. For RAM values bigger than 768 MiB a warning box is displayed telling you of the likely failure. Hence drop it down to that value, it usually works (unless the PC does not have much physical memory). Using the lower value will not matter for most testing purposes. In fact it is likely to help with testing as many users never have the fall amount of RAM available anyway, so you are testing closer to real world scenarios. 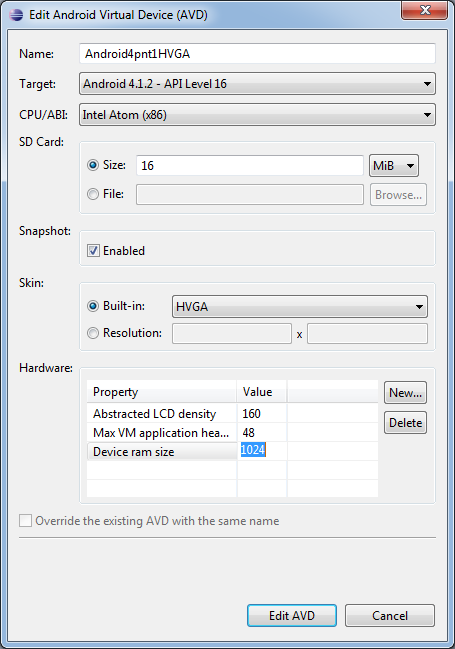 The RAM size is changed by editing the Device ram size value in the Hardware table and then saving it by pressing the Edit AVD button. The value of 768 MiB seems to be the sensitive memory size for Windows machines. 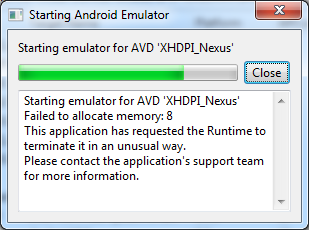 This flushes out the system memory and resets any Android Debug Bridge (ADB) and Emulator variables and paths that may have not reset correctly when the error occurred. Free up more system RAM by closing anything that is currently running except for the programs needed to develop the Android software. 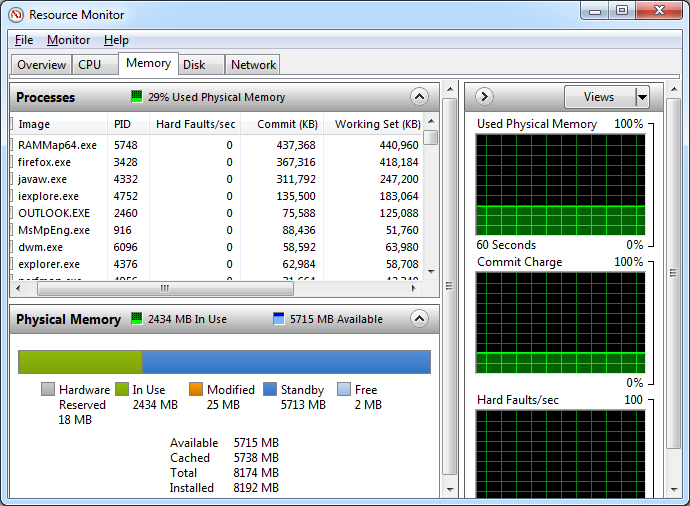 Closing programs eases the stress on the Windows memory manager so it can better service requests for very large amounts of RAM. It has been shown that when the Failed to allocate memory error occurs closing unused programs can allow the AVD to start, that includes closing other AVDs running that are not currently used. If you are developing on a PC that is more than a few years old then you are probably struggling with the Android development cycle. A good development machine should be running a 64 bit Operating System with 4 GiB of memory as a minimum and a multicore processor. Such a machine allows for a faster code, test, debug cycle. The more physical memory the less chance of getting the Failed to allocate memory error when running an AVD. Starting a lower specified AVD, closing it and then running the AVD that is giving the Failed to allocate memory error sometimes allows the failing AVD to run. It appears that successfully starting a AVD can reset some memory enough for the previously failing AVD to run. As a last resort you can simply use the actual device that is trying to be emulated. Of course you need to own the device. Reduce the RAM setting for the AVD to 768 MiB or less. Use a more powerful PC (64 bit OS with lots of physical memory). Open a different AVD, close it then open the failing AVD. See the list of all the Android articles on this website in the site's index. Hmm...but what about CPU requirements? If I have a single core machine that I want to dedicate to just the AVD, is that OK? Could I do that with a 1.5GHz CPU and do well? Using another PC for the AVD is one thing we have not yet done. Though others have had success doing so, see Remote Debugging with Android Emulator. There is no CPU requirements listed for the Android SDK but a 1.5 GHz PC CPU would be considered underpowered, you would need to try it to see how it performed. If the CPU supports virtualisation install HAXM and use a x86 AVD to boost performance.